Good games to Shamanic and Tieria, and later Zaarock and kodairasaru, both of whom pummeled me to a pulp. I guess I've gotten pretty rusty this last week. ggs to everybody that gave me some Grys Vok practice... Zaarock, GalactaKnight, and theendofreds. And Schooly D was playing yesterday! Schooly sightings are about as rare as Menthol sightings these days. GG to chunkypuff, zaarock, and shamanic. It's good to be back! Recently changed ISP and it often run like crap. Good games to Shamanic Beat, Dinkleseed, and MasterFygar, who has come back at last. It's nice to know that there are others who are familiar with Youtube Poop. chunkypuff31 wrote: Good games to Shamanic Beat, Dinkleseed, and MasterFygar, who has come back at last. It's nice to know that there are others who are familiar with Youtube Poop. Right back at ya (and Sham, and Dinkleseed)! I didn't know any of you guys knew the ways of King Harkinian as well I'll be on all the time now, hope to see you guys on again! MasterFygar wrote: I'll be on all the time now, hope to see you guys on again! That's great, I hope to play against you sometime soon! GG's last night to Chunky, Shamanic, Kygen, Tieria, Kongbox, neoKEN, Emperor (! ), and Specy (!!!). I logged on last night with the intention of testing out my new wireless configuration, and it ended up turning into another all-nighter. Now I get to play on a bigger, better TV, and it doesn't look like the lag is that bad. Some of you witnessed my 42-0 start before LoveYourLife made me hate my life, handing me my first loss of the night, and I had a hard time recovering. Special thanks to Chunky, who gave me my 4000th Ranked win! I'll be out of town starting on Wednesday, returning on January 2. I hope everyone has a merry Christmas and a Happy New Year, and I'll be playing against you again when I get back. Wasn't expecting a big party tonight. And I'm really starting to like my gears of wall tactic of hiding behind the wall the entire battle. Well for my first ever long run of VOOT, I'd like to thank arcCAVALIER and HAYONAGENKAI for destroying me pretty badly, even though I did manage to nab a round here or there. There were others I faced, but these two kept me going for more again and again. I'll probably play a bit more in a little bit, but I need a break for a little bit. I don't want to end up stuck on this for hours on end. More good games today to anikingVOOT and Zaarock. Those were some great matches. I still feel like crying how my Temjin got his head crushed by the back of aniking's lasers, though... I thought I was at least going to not get destroyed that last round. Guess not. gg aniking, phantom, men doru (#1 dordray), mechazoidal, kongbox, chasiumen, schoolyd, and nob. Well for my first real xbox lobby experience (only done 1 v 1 lobby twice before) I would like to do a big thank you to all of you, great to see you guys online, hope to play those I missed next time, but a special thank you to phantom for showing me how (repeatedly) how to dominate a Fei-Yen Kn VR . Also (incase you didn't realise) - I had my mic muted by mistake and the repeated invites sent was only me trying to activate chat (typical nob style). When I did get to return a little while later a thank you to both NeoKen360 and Mecha-something - sorry the scotch started to catch up to me - for the round robin rounds we did. I hope the net is stabilised in the upcoming weeks. Were great matches and nice to see some good speed out of those big fat boys. All in all, its a pleasure to meet all of you online and I will try get on similar times to match up with you all. Lastly, if when battling me,do you guys experience any noticable latency as well - as I am not really in the neighbourhood ^_^. p.s (ok the above wasnt lastly ) who were the Japanese talking in the lobby? 1 guy sounded like he was talking Japanese to another guy, then switched to English and was teaching one of you some moves - effective ranges I think - This was earlier on when I didnt realise i had my mic muted too). Last edited by Some_Nob on 30 Jan 2011, 08:18, edited 2 times in total. Some_Nob wrote: but a special thank you to phantom for showing me how (repeatedly) how to dominate a Fei-Yen Kn VR . Phantom is like that. I use as my Traing A.I./Sparring buddy. Some_Nob wrote: When I did get to return a little while later a thank you to both NeoKen360 and Mecha-something - sorry the scotch started to catch up to me - for the round robin rounds we did. Some_Nob wrote: p.s (ok the above wasnt lastly ) who where the Japanese talking in the lobby? I guy sounded like was talking Japanese to one guy, then switched to English and was teaching one of you some moves - This was earlier on when I didnt realise i had my mic muted too). That was probably AnikingVoot. He's like the Final Boss of Voot. Edit: I have no idea why there 3 qoute boxes in one. Last edited by neo helbeast on 30 Jan 2011, 12:14, edited 3 times in total. Ah, well I'm gonna have to try learn not to be punished by him so hard.. have to re-tune my moves for his nice aggressive play. That and also get my head around the CC moves (keep attempting to do crouch bowgun -> which actually does that guard counter trip kick move -> which in turn says punish me while I take my time showing you my legs. Yes was Mechazoidal, Mechazoidal - I salute you, (well I salute you all was great - except for Phatom, you sir.. I bow down and pray to). Aniking VOOT... another Final Boss.. call a paramedic Im gonna need my heart restarted . Next time I see him (and have my mic turned on) I ask for some pointers on how not to get beaten by Phantom (or any one really) so quickly. Perhaps a shrine to worship him may help? (move aside Phantom). And wow, thank you for such speedy reply too ^_^. Some_Nob wrote: Next time I see him (and have my mic turned on) I ask for some pointers on how not to get beaten by Phantom (or any one really) so quickly. Perhaps a shrine to worship him may help? (move aside Phantom). You needn't bow down or worship...I'd rather not have my ego inflated like that. Really, it ought to be Aniking you bow down to (if anyone), or maybe Schooly. I am not the best around here (not by a long shot), and I am certainly beatable. I just happen to be one of the better non-Japanese players on account of how few non-Japanese players there are to play this game. Here are some tips, which some players have taken advantage of. Some_Nob wrote: have to re-tune my moves for his nice aggressive play. By now, you've learned that I am one of the more aggressive players. The way to beat me is to force me to overcommit. In fact, that is typically the way to win this game. 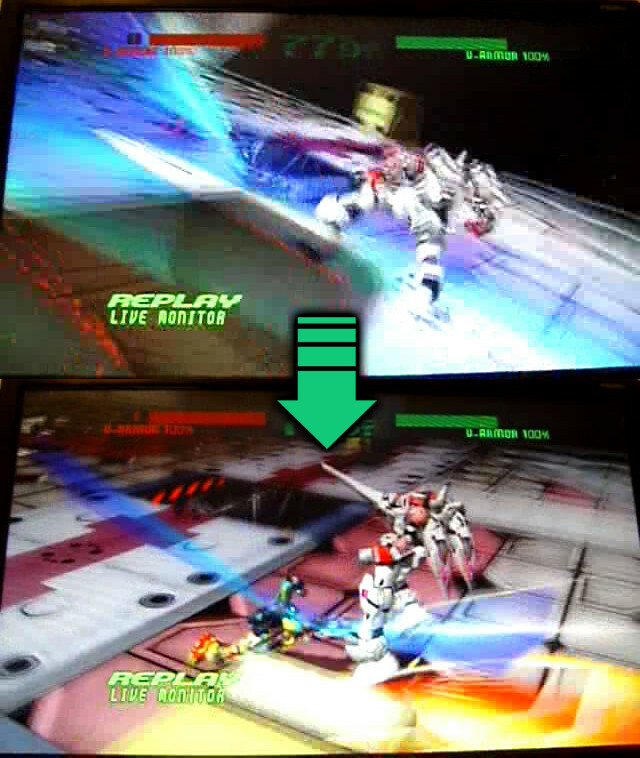 Force the other guy to commit to a dash attack first by using lots of fast standing/walking/crouching attacks, and then when he makes a move, you try to time your attack so that it hits just as the other player enters his freeze time (the latency experienced when the player ends a dash or lands from a jump). Japanese players, in particular, are excellent at this. No matter how much you want to attempt a dash attack, you have to restrain yourself until the perfect moment (it's kind of hard for me because Temjin is one of those VR's that can frequently get away with making the first move). Patience is the key. So far, it looks like you are doing quite well at this. For you, I would work on comboing moves together for better impact. For example, as Fei-Yen, you want to try crLTLW (nearly impossible to escape at close range), followed by one of the CW variants, like LT or just standing CW. The goal is to make them flinch with the first move, and then cause damage with the second move. This is a strategy that I use, and a lot of the better players do so as well. Find out which moves work best in different situations, and combine them together, while also using timing and positioning to your advantage. It really comes down to experience, and that's something I have a lot of. Through experience, you will gain "VOOT sense" and be able to predict the opponent's moves, and "feel out" what to do and when. All of us will be able to help you with this. It also helps that you have a great personality, and a desire to learn more. We respect you for that, and we'll gladly help mold you into a better player, so that you can take down Japanese players with confidence (*cough*Aniking*cough*), and so the game will be more fun for you. Don't be afraid to ask for help. That's what we're here for. In time, you'll be bowing down to no one. Some_Nob wrote: Well for my first real xbox lobby experience (only done 1 v 1 lobby twice before) I would like to do a big thank you to all of you, great to see you guys online, hope to play those I missed next time, but a special thank you to phantom for showing me how (repeatedly) how to dominate a Fei-Yen Kn VR . Some_Nob wrote: p.s (ok the above wasnt lastly ) who were the Japanese talking in the lobby? 1 guy sounded like he was talking Japanese to another guy, then switched to English and was teaching one of you some moves - effective ranges I think - This was earlier on when I didnt realise i had my mic muted too). More than half the party was Japanese. Chasiumen, Kongbox, Aniking, Men Doru. Should be noted that Aniking is #1 Dordray since he defeated the #1 Dordray, Men doru . The new era of Dordray has begun! Hi again, just want to thank Zaarock for the beating. The near half hour season was a great work out with the lag noticably less than the last time. The occasion round and even rare match win u let me get were very treasured. hope to have another season with u (and everyine else) need to work on those air dashes - I have this notion that air attacks leave u open and so need to train myself to use them. Great matches all round. Thx for the training. - "oh no you don't"
I've uploaded the video if anyone is interested. Quite possibly one of the funniest moments ever in my VOOT career (all 13 months of it). It's because of stuff like this that I love playing this game, especially with you guys. Had some fun with chiwageka today, and had a lot of fun, close games with sandsfel. Great matches. Good games to Tristan Malphas and BC 8o8! Very rare to see a Commando player. BC 8o8's Dordray was quite a surprise to me. For more than 1 day now, there was a decent size VOOT party with Shamanic Beat and Chunkypuf, but either one of them set to private so one else could join in. What's up with that? Me and some other players try to join, but couldn't since it was private. I even message them, but got ignored. Personally, I think that's a douche move. The English speaking community is small as it is and now you guys are excluding players?